Easy Vegetable Paella is gluten free and almost syn free and tastes even better the day after. You can vary the types of herbs and spices you use depending on what you have in the cupboard and what you like to eat. You can make it as spicy as you like depending on the amount of chilli and spices you add. The amounts here makes 4 generous portions. 2 medium onions coarsely chopped. 200g long or short grain rice. 2 garlic cloves finely chopped. Herbs and spices to taste, in this case we used mixed herbs, chilli flakes, garam masala, corriander seeds, along with salt and pepper. Low calorie cooking oil spray. Spray a large wok with the low calorie cooking oil spray, and place the pan on a medium to high heat. Add the onions and garlic and allow to soften a little. Add the rice and the herbs and spices. Allow the rice to absorb any juices in the pan for a minute or two. Add the chickpeas and the tomatoes, and mix well. Bring to the boil and check the amount of liquid in the pan. You will have to add plenty of boiling water to ensure the rice has enough liquid to absorb. You may need to add a little more water if the mixture goes a little dry. Cook on a low simmer until the rice is cooked and allow to rest for 10 to 15 minutes before serving. 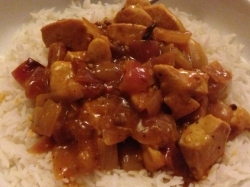 If you like Chip Shop Style Curry but want to control what goes in to it you can easily create this yourself. Curry can be made as mild or as spicy as you like, depending on the amount of chili used. This recipe serves 4 and has 3 syns per portion due to the oil, gravy granules and cornflour used. 400g chicken pieces cut in to 2cm cubes. 1, 2 or 3 chili peppers finely chopped, depending on how hot you like your curry. 1 inch ginger finely chopped. 1 desert spoon of onion gravy granules. 1 desert spoon of cornflour made in to a paste with a little water. 1 teaspoon each of: turmeric, garam masala, corriander, cumin – or – 1 desert spoon of curry powder. 1 spoon of vegetable oil (we used cold pressed rapeseed oil). Place a large wok on high heat and add the oil. Add the onions to the wok and cook on a high heat a couple of minutes. Add the chili, ginger and garlic and cook for a minute or two more. Add the chicken and continue to cook for a minute or two, mixing to ensure all pieces get a little browned. Add the dry spices and season with salt and pepper. Mix well to ensure all pieces of chicken are coated with the spices. Add a little hot water to make a thick gravy. Add the tomato puree, gravy granules, cornflour paste and mix well. Reduce heat down to a slow simmer and continue to cook for a few more minutes with the lid on until all of the chicken pieces are cooked. Remove from the heat and allow to rest for a few minutes before serving with plain boiled rice. Lamb Rogan Josh Curry can be made as mild or as spicy as you like, depending on the amount of chili used. This recipe serves 4 and has 3 syns per portion due to the oil used. 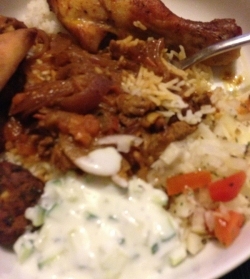 Here we have served the rogan josh with some boiled rice, home made dips and tandoori chicken to make a full Indian meal. 400g lamb steak with visible fat removed and then cut in to 2cm cubes. 1 or 2 table spoons of vegetable oil (we used cold pressed rapeseed oil). Add the onions to the wok and cook on a high heat for about 10 minutes until the onions have browned a little. Keep stirring to ensure they do not burn. Add the lamb and continue to cook for a minute or two, mixing to ensure all pieces get a little browned. Add the dry spices and season with salt and pepper. Mix well to ensure all pieces of lamb are coated with the spices. Add the tomatoes and tomato puree and mix well. You may need to add a little hot water if the mix is too dry, reduce heat down to a slow simmer and continue to cook for a few more minutes with the lid on. 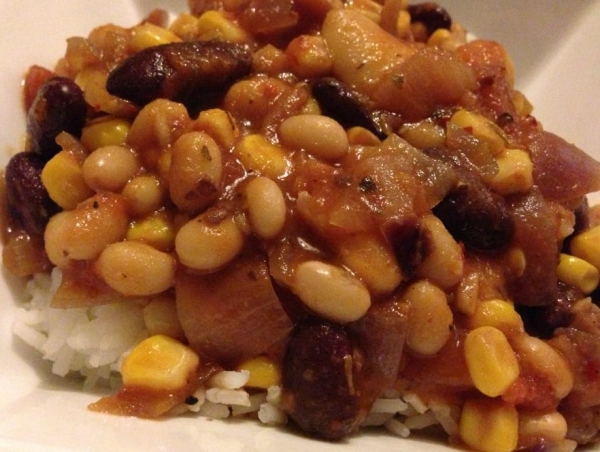 Four Bean Chili is a very simple dish to prepare using tinned ingredients for the large part. It works very well if prepared in advance as the flavor improves if left for a few hours. This amount of ingredients makes about 8 portions, and the extra can be frozen and used when convenient. You can vary the type of beans used as all types of tinned beans (apart from baked beans in tomato sauce!) will work in this recipe. 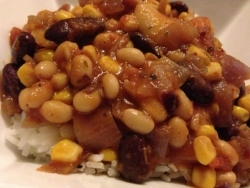 The two most important beans are kidney and sweetcorn, and should always be used. 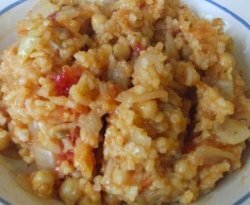 You could make this with more or less types of beans depending on what you have in the cupboard and what is on offer in the supermarket. Spray a large wok with plenty of the cooking oil and place on a medium high heat. Add the onions and cook for a few minutes until softened. Drain and add the kidney beans, and mash some of the beans to thicken the sauce. Drain and add the other beans. Add the lime juice, herbs, salt and pepper and mix well, allowing some of the lime juice to boil off. Add the tomatoes and the tomato puree. You may need to top up with water to cover the ingredients. Bring to a boil and then turn down to a low simmer. Cook for at least 45 minutes, although the longer the better. Serve with plenty of plain boiled rice. This is a quick and simple variation on Egg Fu Yung using some left over rice too. There are many different vegetable ingredients you could add, such as peppers, cabbage, mushrooms etc. we just used what was to hand. 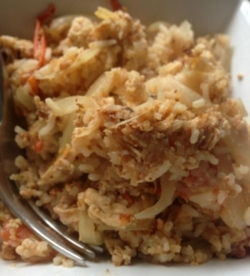 Many egg fu yung recipes also include a sauce that will add many calories. This version has one syn per portion due to the oil used. The amount of ingredients shown here will serve 4. Add a little cooking oil to a large non stick wok and place on a high heat. Add the onions and tomatoes to the wok and stir fry for a couple of minutes until the onion has browned a little. Add the eggs and mix in to the vegetables. Add all of the seasoning and continue to mix and cook on high heat until the egg is mostly done. Move the mixture to the side and add the cooked rice. Allow the rice to heat up for a minute or two before mixing all of the ingredients together. Add a large dash of Soy Sauce and mix in for a minute of two. 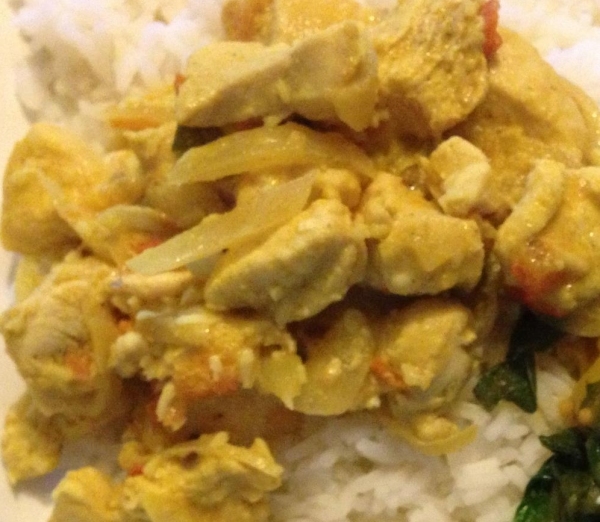 Chicken Korma curry is often full of cream and therefore is high in syns, but there is a very healthy alternative. By using fat free yoghurt you still get the creamy taste, but with very little of the calories, and 4 syns per portion. Spray a large wok with the low calorie cooking oil spay and place on a high heat. Add the onions, chilli, garlic and ginger to the wok and heat for a few minutes until the onion just begins to brown. Add the chicken to the pan and cook through for a few minutes. Add the tomatoes and continue to cook for a minute or two. Season with the spices and salt and pepper and mix well to ensue all chicken pieces get an even spice coating. Add the dessicated and creamed coconut, mix well, and continue to cook on a lower heat for a few more minutes with the lid on until all of the chicken pieces all lightly cooked through. Check some of the larger pieces of chicken by slicing in half to ensure they are cooked all the way through. Once you are happy the chicken is cooked take the pan from the heat and allow to rest for a few minutes with the lid on. Add the yoghurt and mix well just before serving, in this case we served with plain boiled rice. 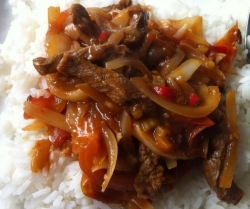 Chinese beef tomato with boiled rice. 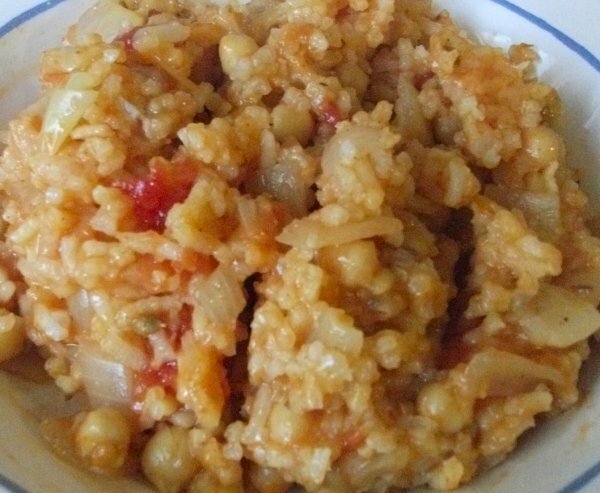 This dish can be made with or without chili to make it as hot and spicy as you wish. 400g quick frying beef steak cut in to thin strips. 400g tomatoes cut in to thin wedges. 1 chili pepper finely chopped. 1 inch root ginger finely chopped. 1 teaspoon Chinese 5 spice. Make a paste from the cornflour mixed with 1 tablespoon of soy sauce and set aside until later. Add all of the remaining ingredients to a mixing bow, mixed well together, and allow to marinade for a few minutes while your wok heats. With the wok on the highest heat, spray with low calorie cooking oil, and add the ingredients from the mixing bowl. Stir fry the ingredients until the beef is lightly cooked, and add the cornflour and soy paste. Mix well to coat all of the ingredients in the paste. Remove the wok from the heat and allow the mixture to rest for 5 to 10 minutes before serving with plenty of plain boiled rice. The cornflour paste has the effect of retaining a lot of heat in the mixture, and so the resting is important in this case.